The Holton Wildcats will have to rebound from a regular season loss for the first time since 2011. The second-ranked Wildcats host Maize South (1-0) in a second, early-season test. Holton fell at Class 3A power Silver Lake 18-7 last Friday night. The Wildcats typically dominant wishbone attack was held to only 121 yards rushing and just five first downs. Trailing 12-0 in the third quarter, Holton’s only score came after a 94-yard kickoff return by Justin Rieschick to the Silver Lake 5-yard line. Still it took four plays for the Wildcats to score on an Indie Allen short run. There was bound to be some growing pains for the young Wildcats as only a couple of starters returned on each side of the ball from last season’s run to the 4A state semifinals. Allen is one of those players with some experience running the ball. Mason Barta, coach Brooks Barta’s son, is perhaps Holton’s most decorated player at fullback and linebacker. Against an experienced and talented Silver Lake defense, the Wildcats averaged less than three yards per carry. Allen led Holton with 71 yards on 16 attempts, while Justin Pool and Barta added 37 and 21 yards, respectively. The challenge this week is to get the offense going against a Maize South program built on defense under coach Brent Pfeifer. The Mavericks have posted a record of 18-4 since the beginning of the 2012 season and have posted five shutouts during that time. Over that span, the Maize South defense has allowed an average of only 10 points per game. The Mavericks began the season with a 28-0 shutout of Goddard. Talented junior quarterback Korie Frausto opened the scoring with a 25-yard touchdown pass to Spencer Bruner. Linebacker Logan Mormando returned an interception for a touchdown in the third quarter to give the Mavericks a 14-0 lead, and Frausto added a touchdown run to make it 21-0. The Mavericks’ group of linebackers is once again considered a strength and will need a good performance in order to deliver a win at Holton. Coach Kent Teeter faces his former school in his second game as head coach for Holcomb. Teeter coached Goodland the previous six seasons and led the Cowboys to the playoffs in three of the last four falls. His son, Trey, a junior, started for Goodland at quarterback the last two seasons and is under center for Holcomb. Under new coach Josh Stephenson, Goodland opened the season with a 52-28 victory against Wray, Colo. Last season, Goodland beat Wray, Colo. 46-21 in Week 3. Holcomb opened with a 36-0 victory at Cimarron. Teeter faced his longtime friend, Randall Rath, who was the head coach at Oakley for the last 16 seasons before he took over at Cimarron this year. Holcomb has won three in a row against Goodland, a GWAC foe. The Longhorns won 34-12 last season, 28-0 in 2012 and 34-19 in 2011. Holcomb has too much experience, especially with Trey, and earns the victory. Hutchinson Trinity arguably pulled off the state’s biggest upset when it defeated Sedgwick’s Air Raid offense and star quarterback Brylie Ware. The Cardinals were ranked No. 2 in Class 2-1A in the KPreps preseason poll. Trinity delivered a 39-14 victory and limited Ware to 11 of 24 passing for 139 yards. Trinity outgained Sedgwick 316-93 on the ground and held Ware to five rushing yards on 11 carries. Sedgwick, which moved down to Class 2-1A for the first time this fall, had just 12 first downs, none until late in the second quarter. Trinity led 24-0 at halftime. Sedgwick never scored fewer than 34 points in 2013; it marked the fewest points for Sedgwick since a 55-13 loss to Conway Springs in the 2011 playoffs. Elias Jasso-Cardenas collected 16 rushes for 213 yards for first-year coach Jordan Bell. Trinity had lost three in a row to Sedgwick, which was 30-5 in the previous three seasons. Trinity is 3-2 against Marion in its five contests, but has lost the last two games, 19-10 and 10-0 last year. The last meeting came in the first round of the Class 3A state playoffs. Marion is also in its first season in 2-1A after a longtime successful run in 3A. Marion, known for its strong defense under veteran coach Grant Thierolf, opened with a 38-7 road victory against Moundridge. The Warriors ranked No. 10 in Class 3A scoring defense in 2011 and No. 2 behind state champion Silver Lake last season. Marion brings back three offensive and one defensive starter. Marion is 12-2 at home in the last three years, has won nine straight home games and Friday opens the home portion of the schedule. Marion is completely different than Sedgwick; the Warriors will run the option. This will be a low-scoring game, but Marion, playing at home, earns the victory. One of the best small-school rivalries in Kansas, the Mid-Continent League and Highway 36 foes have routinely played close games. The last two years, the teams matched up in Week 9 in a winner-take-all spot in the playoffs. Norton won in 2012 and Phillipsburg collected the victory last year. Norton is 6-4 in the last 10 meetings between the teams, but the margins in that stretch are 4, 13, 27, 13, 7, 7, 6, 38, 16 and 3 points. This season, Phillipsburg switched down to 2-1A for the first time in school history and Norton remained in Class 3A. The Panthers, which finished No. 6 in scoring defense in 3A last season, rolled over Thomas More Prep-Marian in a 48-0 road win last Friday. Phillipsburg delivered 420 yards of offense, including 364 on the ground. Junior Brock Means returned the opening kickoff 90 yards for a score, quarterback Sam Sage had a 59-yard run, Stuart Lennemann had a 78-yard TD run, and Ian Chestnut collected a 56-yard TD run. Norton, with standout freshman Jace Ruder at quarterback, opened with a 46-0 victory against Ellis. The Bluejays scored on their first two offensive possessions and took a 13-0 lead with 4:55 left in the first quarter. Norton led 34-0 shortly before the first half ended. This is going to be a close, low-scoring game where special teams will play a huge role. Lennemann, who helped Phillipsburg to the Class 3A track crown and won the 200 meters, will be the difference with one or two big plays. Troy, led by quarterback Tristan Speer, opened the season with a 30-0 victory against Washington County last week after a strong 7-4 season last fall. Troy, Phillipsburg, Smith Center and Elkhart were the lone 2-1A teams to have a shutout victory in Week 1. Troy had a unique 2013. The Trojans were outscored on the year, 256-249, last season. Troy went 2-3 at home and 5-1 on the road in 2013. 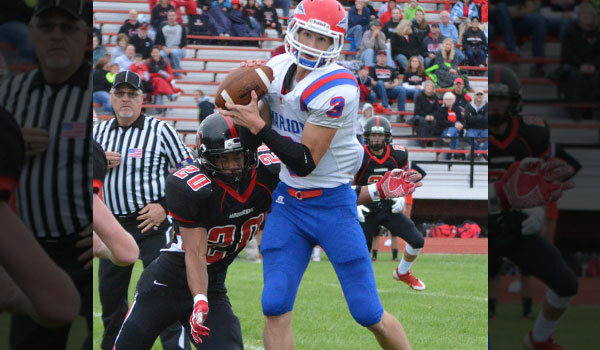 Troy won two games by one point, one contest by six points, and a 26-14 first-round playoff victory against McLouth. But Troy did lose 55-18 to Centralia in district play. Troy has lost eight in a row to Centralia and hasn't defeated the Panthers since a 30-19 win in 2006. Centralia won its 14th straight contest with a 54-6 victory in its first Class 3A game last week. The Panthers rolled to a 13-0 record and the Class 2-1A state championship. Conway Springs (55 points) was the only 3A team that scored more points than Centralia. Troy’s defense will keep Centralia’s offense down, but the Panthers are too talented. Two of eight-man’s best teams and best quarterbacks match up after big Week 1 victories. Osborne has won 14 straight games after taking the Eight-Man, Division I crown last season. The Bulldogs got a boost last Friday night as coach Steve Tiernan watched his team beat Eight-Man, Division II No. 1 Thunder Ridge, 52-28. Osborne junior quarterback Jake Tiernan, the coach’s son, completed 18 of 25 passes for 217 yards and four TDs. Tiernan rushed 14 times for 93 yards. Senior wide receiver Brandt Wolters caught eight passes for 79 yards and two scores. Senior Shane Hendrickson had 15 tackles and Wolters collected 12 stops. Beloit/St. John’s-Tipton, 11-1 last season, rolled to a 68-22 road victory against Hill City last week. BSJT has senior quarterback Trey Dubbert, an outstanding playmaker, along with five other seniors who include lineman Riley Gates, Andrew Eilert and Michael Schmitt. The Blujays are 12-0 at home the last two seasons and will have huge district games at home later in the year against Victoria and Thunder Ridge. But Osborne is rolling after a Week 1 victory. Brandt Wolters, the addition of transfer Richard Zeiters in the backfield and Tiernan’s pinpoint passing will allow Osborne to capture a big road win. Maize South, Holton, Silver Lake, Justin Rieschick, Indie Allen, Mason Barta, Brooks Barta, Justin Pool, Brent Pfeifer, Goddard, Korie Frausto, Spencer Bruner, Logan Mormando, Goodland, Holcomb, Kent Teeter, Trey Teeter, Josh Stephenson, Cimarron, Randall Rath, Oakley, Hutchinson Trinity, Marion, Sedgwick, Brylie Ware, Elias Jasso-Cardenas, Jordan Bell, Grant Thierolf, Phillipsburg, Norton, Thomas More Prep, Brock Means, Sam Sage, Stuart Lennemann, Ian Chestnut, Jace Ruder, Ellis, Troy, Centralia, Tristan Speer, Smith Center, Elkhart, Conway Springs, Osborne, Beloit St. Johns-Tipton, Steve Tiernan, Jake Tiernan, Brandt Wolters, Shane Hendrickson, Hill City, Trey Dubbert, Riley Gates, Andrew Eilert, Michael Schmitt, Thunder Ridge, Victoria, Richard Zeiters, Emporia, Junction City, Wichita Northwest, Kapaun Mt. Carmel, Maize, Garden City, Blue Valley Northwest, Mill Valley, Bishop Miege, Gardner-Edgerton, Olathe East, Olathe South, Olathe North, Lawrence Free State, Andover, Andover Central, Andale, McPherson, Bonner Springs, Chanute, Fort Scott, Spring Hill, Eudora, Louisburg, Baldwin, KC Piper, Frontenac, Riverton, La Crosse, Larned, Hesston, Halstead, Meade, Lakin, Perry-Lecompton, Madison, Uniontown, Sharon Springs-Wallace Co., Oberlin-Decatur Co.